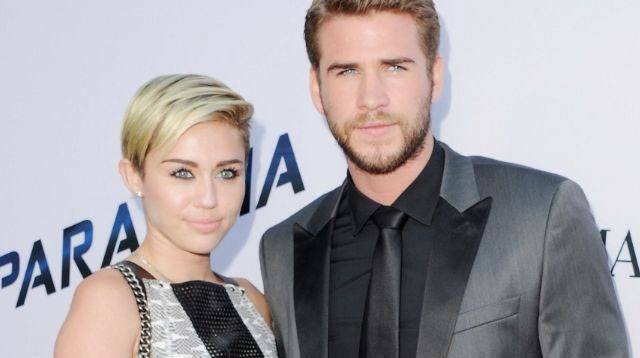 They seem to be one of the most solid couples in Hollywood right now, but that wasn't always the case for Miley Cyrus and Liam Hemsworth. The pair, who met on the set of The Last Song when they were just 17 and 20 respectively, went through a major split in 2013 after four years together. Thankfully, the two are back together, engaged and rumored to be married any day now. They've remained fairly quiet about their split, during which Miley dated Patrick Schwarzenegger and Liam was pictured kissing another girl. Now, though, it seems that Miley is ready to open up, and when asked during a radio interview with SiriusXM's what advice she'd giver her younger self, she didn't hold back, explaining that "everything is happening for a reason." "I knew that when we weren't together for the first time. I didn't know if that was the end of it or know if we'd be back together again, but knew that wherever I was going, I was on the right path. "I think people that break up and get back together, that's awesome. You get time to be yourself. You get time to grow up. I think if you're growing up attached to another person, you never really get solid as your own being. So I'm really solid, and then he gets to be really solid. And together we get to be two really grounded people. It's not a half and a half making a whole." The "Wrecking Ball" singer has previously explained that the two were changing in different ways before their break-up, and needed time apart. She has also told of how they had to "re-fall for each other" when they got back together. Miley has recently released her new song, "Malibu," which she openly admitted to writing about her fiancé because she wanted to take back the narrative of the relationship. "They're going to talk about me if I come out of a restaurant with Liam. So why not put the power back in my relationship and say, 'This is how I feel'?" she said. On "Malibu," she sings about how Liam saved her, and how they are embarking on something new. Liam shot the cover art, which she shared on Instagram recently.